This lamp range includes 15w, 18w and 36w versions and has proven to be highly reliable, deliver high performance over time, be the most environmental solution on the market and allow best in class maintenance planning thanks to its long life time as is shown in the diagram. 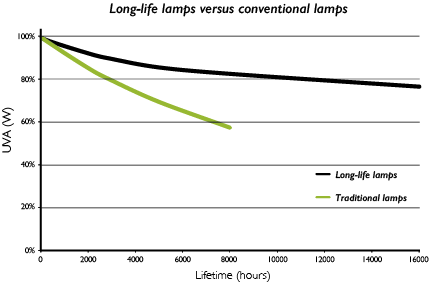 According RoHS the lamp can hold 5mg of Hg, but the Long-life lamps use only 3mg of Hg. A saving of 60% on the use of mercury, which results in a significant environmental advantage. consider glass breakage as a unacceptable risk factor: pharmaceutics, cosmetics and many other industries. For this reason the UV-A lamps are executed with a special sleeve, which is produced from UV-A transparent material: the so-called shatterproof coating. The shatterproof material used is very strong, durable and has a high UV-A transparency rate. 2) Ensures that at a lamp drop from 5 meters, the glass fragments will be retained in the sleeve. 3) More than 95% transparent for UV-A light. 4) Melting point over 280 Celsius degree.